The results are in and we’re waiting for the interpretation. Maybe this indicates the intricate brain waves of a highly evolved humanoid (hopefully)? Is the life that some of us lead eternally facing a mental brick wall? It’s a nice and pretty dead-end, but where are the sunny broad horizons imagined way back when we were all going to “grow up to be President someday”. 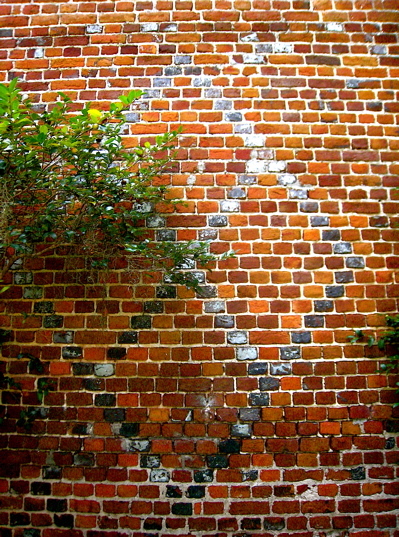 Back in reality-land, this wall was built in the 1700’s and shows off the skill of the brick mason. Consider the photo a texture study. We’ll not subject you to the Artist’s Statement. Appropriately enough, this image is from Retreat Plantation. It’s football season, drop back and punt.